A very interesting new paper from MIT, entitled “China’s Ideological Spectrum,” has been making the rounds over the last few days. It uses some unique survey data to show what some basic political terms mean in practice in China. The paper identifies the “core ideological divide” among Chinese people as between left-conservatives (authoritarian government, socialist economics, traditional social values) and right-liberals (constitutional politics, market economics, individual rights). The authors find that support for left-conservative views is highly correlated; in other words, that people who look with nostalgia upon the planned economy also tend to have traditional social values and support authoritarian government, while those who favor, for instance, gay rights also tend to support more market-based economics and democratic politics. This pattern is quite different from the contemporary West, where many people are both economically conservative and socially liberal, or vice versa. (Another key point is that conservatives in China are considered to be left, while liberals are considered right–the opposite of the American usage, though sensible since what Chinese conservatives want to conserve is in fact a leftist system). While the broad conclusions are probably not surprising to those familiar with China, the explanation is clear and the empirical evidence strong and interesting; very much worth reading. 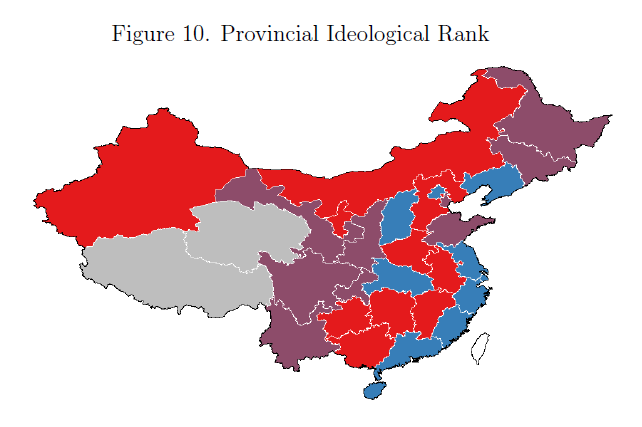 While there are a lot of interesting details in the paper, being a lover of maps I of course immediately looked at the map, which shows the variation in ideology around China. I’ve reproduced it below; the 10 most conservative provinces are colored red, the 10 most liberal blue, and those in the middle purple. The authors run some regressions and find that provinces with more liberal populations also tend to have higher incomes, more openness to trade and higher rates of urbanization. The broad pattern is reasonably intuitive, as are some of the specifics (Tianjin being more conservative than Beijing will surprise no one who has been to both places). But I also wondered, if conservatism means in part support for the state role in the economy, why not also measure its relationship to a state role in the economy? Given that we are talking about a leftist system, a little Marxist analysis seems appropriate: how is the superstructure (ideology) related to the base (economy)? Or to put it a different way, do people whose livelihoods depend on SOEs think more highly of SOEs? Below is my own map of state influence over the economy, color-coded in the same way: red for the 10 most state-dominated provinces are red, blue for the 10 least are blue, and purple for those in the middle. The indicator I used is state-owned enterprises’ share of gross industrial output. 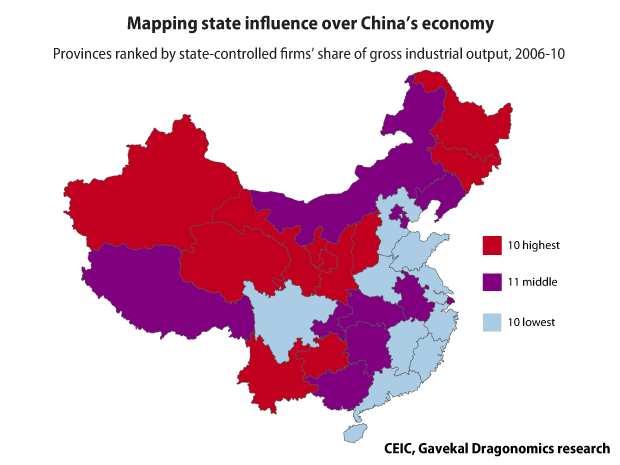 This is not a perfect measure, as it does not include the service sector where many SOEs operate–Beijing’s highly service-driven economy is also heavily state-owned, and if services were included then Beijing would almost certainly be in the 10 highest, rather than in the middle as shown here. But the pattern seems broadly correct: provincial economies are least state-dominated on the eastern coast, more so in the central provinces, and most state-dominated in the old industrial bases and resource-heavy border areas. This map also lines up pretty well with the ideology map, though there are some interesting divergences. The old industrial bases of Jilin and Heilongjiang in the northeast, which certainly have some of the most state-dominated economies in China (and currently among the worst-performing), register as only moderate in their ideological conservatism. If I had to come up with an explanation for this, it would go something like this: the large role of state enterprises in these provinces has not in fact been a good thing in the last couple of decades. There were mass layoffs and immense social dislocation in the late 1990s as money-losing SOEs were overhauled, and there has been a lot of out-migration to more prosperous regions since then. Northeasterners do tend to be rather socially conservative, but because of their own experiences I suspect they are also unlikely to have the illusion that state-owned enterprises are wonderful things.